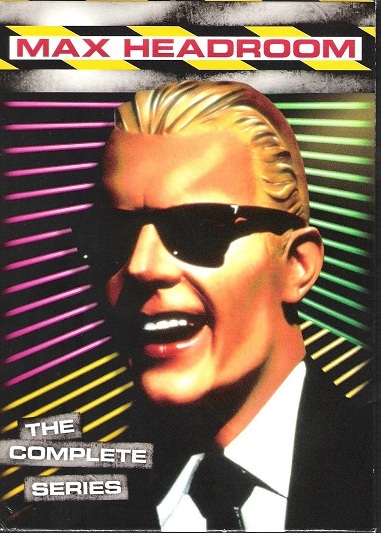 Digi-Schlock: MAX HEADROOM – THE COMPLETE SERIES (Shout! Factory DVD) – Schlockmania! Max Headroom fans have had to be a patient breed over the years. To relive the show, they’ve had to rely on dupey-looking DVDR’s drawn from old broadcasts or VHS tapes that contained only a few episodes. However, the wait has ended. Shout! Factory has stepped into this DVD-void to serve up a set that offers the full run of the U.S. television series version of Max Headroom plus some noteworthy extras. Thankfully, the results are worthy of the show’s cultish devotion. The show is presented as a five-disc set, with four of the DVDs devoted to the series and the fifth focusing exclusively on extras. Video transfer quality is solid if not exceptional: the level of detail can be soft in places and the co lor seems slightly muted. That said, part of these problems seems to be the show’s visual approach, which mixes several types of video quality and different film stocks. It also frequently favors an oh-so-1980’s “diffused lighting” look in interiors. That said, everything here is quite watchable and it’s a huge improvement for anyone accustomed to VHS tapes or fuzzy DVDRs of this material. The sound on the episodes has not been remixed, instead sticking to the original mixes. The end results sound fine, with a solid blend of dialogue, effects and music. Optional English subtitles are included and first time viewers will be glad to have them (not because the sound is problematic – the subtitles make it easier to catch anything you might miss in the rapid-fire, techno jargon-heavy dialogue). Fans will also be happy to know this set contains all 14 episodes of the U.S. series: only 13 were shown during its original network run, with the missing episode, “Baby Grobags,” not being broadcast in the U.S. until 1995. The fifth disc is where this set really shines. It offers just over two hours of featurettes that chronicle the story of the Max Headroom phenomenon from several different vantage points. 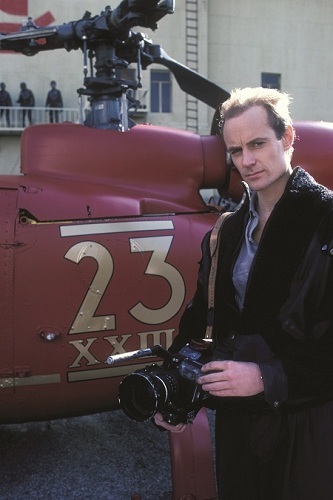 The first and largest is “Live On Network 23.” It focuses on behind-the-camera collaborators and devotes plenty of time to the concept’s original creators – Rocky Morton, Annabel Jankel and George Stone – as well as input from producer Peter Wagg, writers Michael Cassutt & Steve Roberts and line producer Brian Frankish. This piece is about an hour in length but breezes by quickly as the players chart the birth and evolution of the Max Headroom concept and the different shows he was used in. It’s a fascinating piece as everyone is honest in admitting how many different creative “parents” were involved in making the central character into what he ultimately became. The occasional bit is glossed over – for instance, Morton and Jankel’s displeasure with being left out of the show American incarnation is briefly mentioned and then never explained by Wagg – but the staggering amount of info and context offered here makes it well worth a look. The remaining featurettes go into more specific territories of the Max Headroom story. 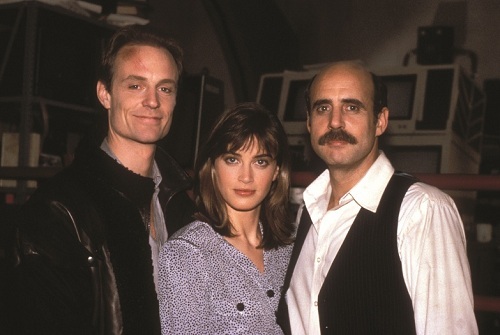 “Looking Back At The Future” is a breezy round-table chat that includes Jeffrey Tambor, Concetta Tomei, Amanda Pays and Chris Young, with Lost creator and Max Headroom fan Javier Grillo-Marxuach sitting in as moderator. Matt Frewer is noticeably absent from the proceedings and that’s unfortunate given his huge contribution to the show. That said, the attending cast members have plenty of fun behind-the-scenes stories to tell and each offers their personalized takes on the whole experience, with Tambor and Tomei amusingly admitting they had to read the scripts a few times to get what was going on. Continuing on the acting tip, “The Two Big Blanks” is a two-person piece in which Tomei and Morgan Sheppard reflect on their history with the show and their working relationship as the show’s two main “Blank” characters. It’s a bit of a mutual admiration-fest between the two but both are charming and their strong chemistry makes it a lot of fun to watch. 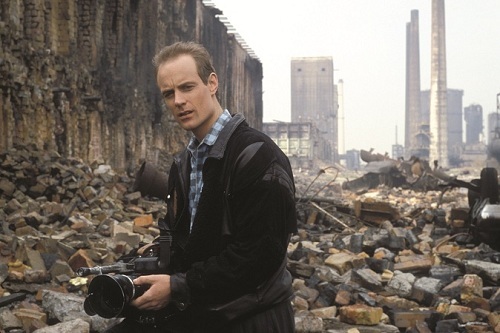 The next two featurettes offer the writer’s perspective on Max Headroom. “The Science Behind The Fiction” allows co-creator Stone to hold forth on how his love of science fiction and his approach to the future and technology influenced what he brought to the table. “The Writers Remember” allows Roberts and Cassutt to reveal what the creative process was like in writing the ABC series (simply put, they had an amazing amount of freedom and spent much time dodging the network executives to keep the shows nice and subversive). The observations presented in both featurettes are brainy and quick of pace, just like Max Headroom itself. The final featurette is a brief chat with line producer Brian Frankish, who had the head-spinning gig of handling the physical production for all the creative staff’s complex, forward-thinking concepts. Frankish is engaging and energetic as he explains how he and other staffers embraced the “seat of the pants”-speed of the show’s development and production schedule and actually made it into an aesthetic. The final touch is an insert booklet with a few essays about the show and credits & synopses for the episodes. Packaging for the set is suitably sleek, with slimline cases used for the discs and a handsomely-designed box that includes a lenticular cover. All in all, Max Headroom: The Complete Series is a nicely crafted set for a show that deserves one. Fans and neophytes alike should enjoy it quite a bit.